The International Campaign for the recognition of the human right to peace, promoted by the National Coordinating Body of Local Authorities for Peace and Human Rights, by the Human Rights Centre and the UNESCO Chair "Human Rights, Democracy and Peace" of the University of Padua, reached the United Nations on 23 June 2014. A delegation of local administrators, including also Professor Antonio Papisca and Professor Marco Mascia, the President and the Director of the above-mentioned National Coordinating Body, Andrea Ferrari and Flavio Lotti, and Padre Egidio Canil, the “foreign minister” of the Sacro Convento di San Francesco di Assisi, met in Geneva, at the Palais des Nations, with Ambassador Christian Guillermet Fernandez, President of the intergovernmental Human Rights Council Working Group in charge of drafting a United Nations Declaration on the Right to Peace, Ambassador Maurizio Enrico Serra, Permanent Representative of Italy to the United Nations, Gianni Magazzeni, Representative of the United Nations High Commissioner for Human Rights and H.E. Mons. Silvano M. Tomasi, Permanent Observer of the Holy See to the United Nations. 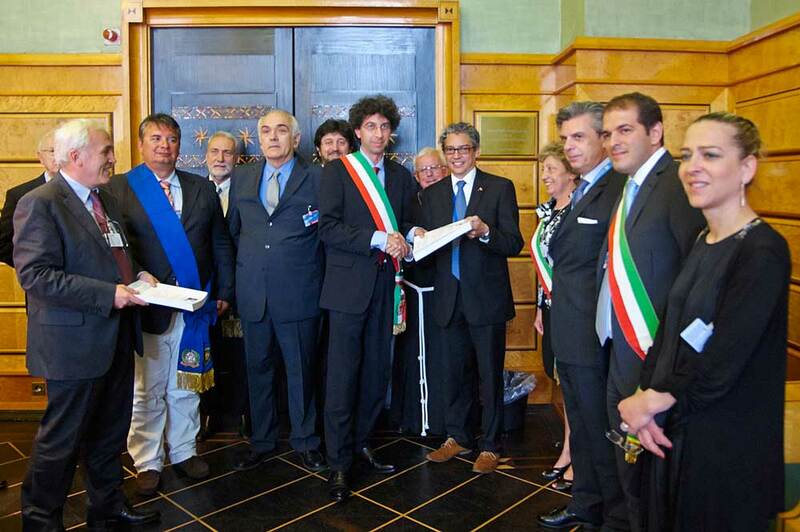 Enrico Rinuncini, Mayor of Ponte San Nicolò (Padua), and Rosa Rizzato, President of the Municipal Council of Este (Padua), joined the delegation as representatives of the Veneto region. A very important and significant moment of this civil society mission, managed in accordance with the principle of subsidiarity, was the official delivery of a copy of the petitionary motions for the international recognition of the human right to peace adopted by 100 Municipal, Provincial and Regional Councils. The Mayors were wearing the tricolour (red-white-green) sash. In particular, the representatives of the Holy See and of the Office of the UN High Commissioner for Human Rights encouraged to spread, at European and international level, the mobilisation started in Italy to denounce the persistent opposition that some countries, including the United Kingdom, the United States and some Members of the European Union, are expressing against the recognition of peace as a fundamental right of individuals and people. Behind this outrageous position, there is the shameful culture of negative peace, seen as a break between one war and another, according to the statement: “if you want peace prepare for war” (si vis pacem para bellum). In other words, there is a will to maintain the issue of peace within the “mortal embrace” of the right to war (ius ad bellum). War and death penalty, as denial of human dignity - mother of the Law -, are denial of Law as well as of life, in which human dignity is embodied. takes into account the fundamental role of local governments and the principle of subsidiarity for the construction of positive peace in the world order multi-level system, in accordance with article 28 of the Universal Declaration of Human Rights. Having at its side the substantive and formal reasons of the Law, the movement of global civil society and of local governments has thus adopted the approach that anchors peace to the paradigm of “human rights for all”, in particular to the right to life, and not to state sovereignty and it is now striving for ensuring that the diplomatic game at the Human Rights Council will not be shamefully played to the lowest common denominator.